HomeAll Posts...What Kind of Aquarium is Right for Me? What Kind of Aquarium is Right for Me? 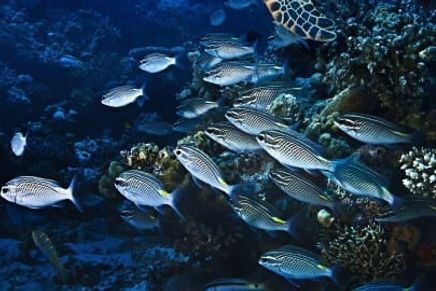 Maybe the kids want a fish, or your dentist appointment wait was a little too long — or maybe you just got back from vacation in a tropical somewhere and want a little piece of the ocean with you! 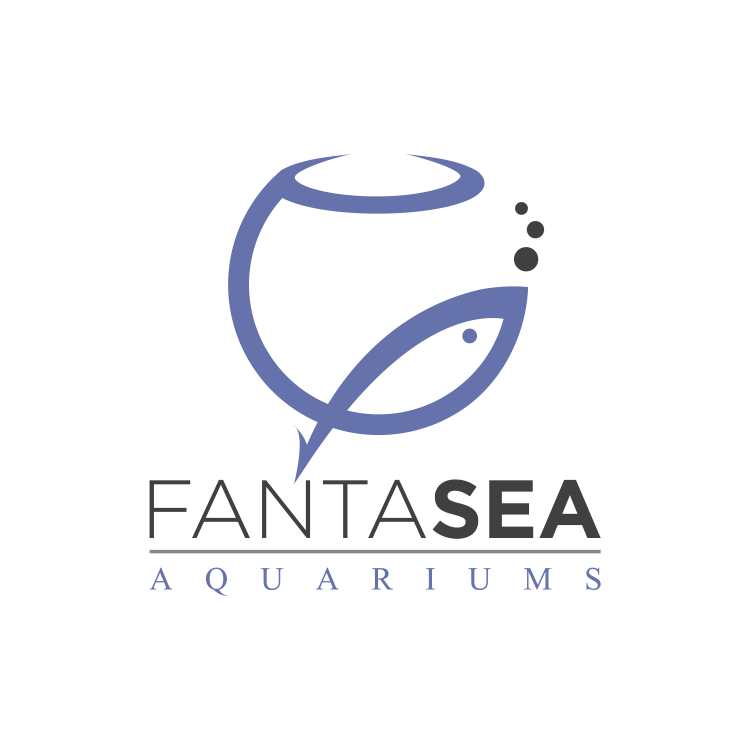 Aquarium keeping is a rewarding hobby, and we’re happy to have you!  Whether you’re just joining, or looking for another tank and wondering what kind of aquarium will suit your needs, take a look at some of the options and descriptions we’ve gathered below to help you decide! Every type of aquarium needs a few basic things which is common between them, such as a heater, light, flow, live rocks and substrate. This is a broad overview of the filtration systems that you could choose between. 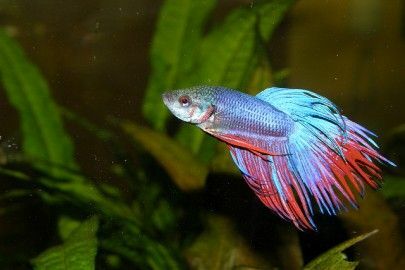 If you’re looking for a tank that filters itself, and don’t want to stuff it to the gills with living inhabitants, consider natural filtration! This kind of aquarium relies on flow, oxygen, and natural bacterial colonies to break down excess nutrients and waste – this is also called biological filtration. 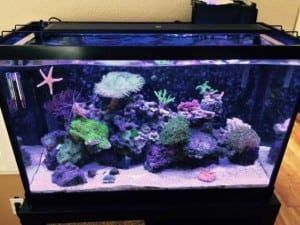 You’re more than likely going to be making up for the lack of additional filtration by doing more water changes (replacing some of the tank water with freshly mixed saltwater), but if this doesn’t scare you then it can be a good fit! A circulation pump and heater will keep your bacterial colonies thriving, and adding an airstone or bubbler will give them plenty of oxygen to work with. Adding a substrate and live rock is perhaps the most important component for natural filtration as this is where the beneficial bacteria mostly lives. A hang on back (or HOB) filter will sit on the rim of your aquarium, pull water in, and let it fall back into the display portion. This provides circulation and air exchange at the surface, while the inside of the filter allows you to hold things you wouldn’t want sitting in the tank with your inhabitants. This can range from filter floss (handy for removing particulates like leftover food! ), to chemical media (activated carbon will remove organics as they break down), to a heater! Some heaters have a slim enough profile that they can be hidden in a large HOB filter, meaning you get more room in your tank for additional water volume, swimming space, and so on. These filters can be a breeze for maintenance – many of them allow you to simply remove the lid and replace whatever filtration media you’re using, without needing to stop the filter or take it apart. Newer HOB filters now also come with a protein skimmer built in. A more unobtrusive option is the canister filter. Similar to a Hang On Back filter, it pulls water out of your aquarium and lets it back in. 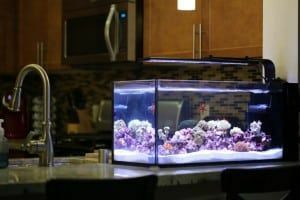 However, this filter sits closed and tucked away from your aquarium, so that it’s out of sight and allows for minimal bulk where you want to display your aquarium inhabitants. You’ll still need a heater for the tank (some can be installed in-line, on the filter’s return pipe), and maintenance will certainly be more involved when the filter needs to be stopped and opened up for cleaning, but many find that this is worth the lack of equipment. A sizable canister filter can also make water changes easier – simply stop the flow or unplug the filter, replace media and dispose of the water in the canister, then fill it up with fresh saltwater and hook up the filter again! Weekly water changes can be a breeze! The availability of different AIO tanks has changed the hobby for the better. From the smallest pico to tanks as large as 50+ gallons are now available. An all-in-one tank has built-in filtration in the back of the tank including return pumps and in some cases, even a skimmer. The hidden filtration section comes with multiple chambers where you can throw in a bag or carbon or make a section into a mini-fuge with a submersible light. A media caddy allows you to use carbon, GFO for phosphate control, or other adsorption media like Purigen. A handy tip is to put filter floss just below the overflow grate, so that particulates can be filtered out of the water first. After that, your chemical and other filtration is up to you. Depending on the tank you have, you may even have enough space for a media reactor or protein skimmer. But if you want to keep it simple, the flow through these chambers is plenty for media bags that can be filled however you like to keep your tank clean and fresh. Need more equipment? Better filtration?  Take a look at sumped aquariums! 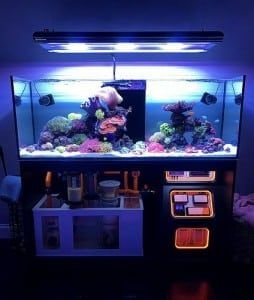 Your display can be full of life and vibrant colors, while your equipment can live in a second aquarium, hidden by your aquarium stand behind closed doors. These tanks use an overflow to drain water out of your aquarium, while a return pump in the sump pushes it back up and into the display. While the water is moving through the sump, it flows through any equipment/filtration you decide to add such as a skimmer, reactor, bio media blocks and/or a refugium. 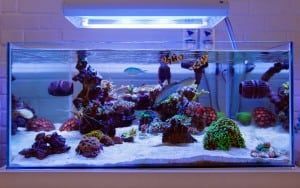 Many aquariums come with built in overflows that distract from the idea of equipment, and allow you to focus on your tank completely. 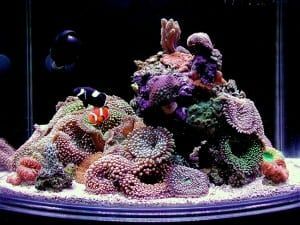 When you’re ready for aquarium maintenance, adding supplements, and setting up advanced equipment like dosing, all of this can happen in your sump while the display is kept free of clutter. You can add your own sump to your tank with a HOB overflow if your tank does not already come reef-ready, which is another way of saying that the tank is pre-drilled for plumbing. Having more water volume is beneficial for many reasons; it is easier to maintain parameters and any oversight in maintenance or dosing accidents in a larger volume makes a smaller impact that the same mistake in a smaller volume of water. 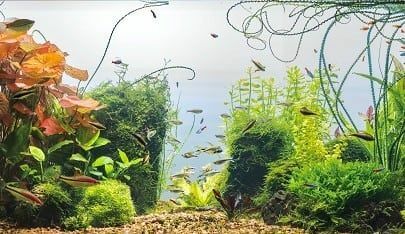 Which aquarium you choose largely depends on the time you can devote to keep it maintained and the livestock you want to have. Keeping it simple is a good option for a non demanding selection of livestock, which having a sumped system is best for livestock that might need routine parameter checks and dosing.